"But whyyyyyyyy did Mommy go in without us?" I was three years old, and I had been very excited when, in their inability to secure a babysitter, my parents had let me come along in the car for their drive to the West Side. I was excited for all the fun, grown-up activities that I was going to be included in that night. We stopped in front of a rather nondescript building and my mother left the car to go in, leaving my father and I behind. Suddenly, this outing was not so fun anymore. As I whined out my question, my quick-thinking father replied, "Mommy has to go to the ladies' club. She will only be there a little bit. We have to wait here because we are not ladies." Even at three, I shared his trait of quick-thinking and responded, "You are not a lady, but I am! You call me your 'little lady' all the time!" He smiled and laughed at both my wit and my innocence and replied, "You are my little lady, but the ladies' club in not for little three-year-old ladies; it is for grown-up married ladies. Please G‑d, when you are a grown-up married lady, you will join the club." By the time the conversation was over, my mother had returned to the car. I had no more questions that evening, and it would be a decade or so before I would know about the physical cycle that necessitates the use of the ladies' club, as well what happens in there. I wanted my mother to be there as I began this special journey in my lifeSeventeen years have passed since that night with my parents in the car. Much has changed since then. I have younger brothers now; my mother no longer has to travel to West Side because Chabad has opened up a lovely new "branch" of the ladies' club on the East Side, and, most importantly, I was just inducted into the club a few hours ago. My mother accompanied me on this special mission. Weeks of preparing, planning, and studying have all come down to tonight, and I wanted my mother to be there as I began this special journey in my life and my relationship with G‑d and the Jewish People. 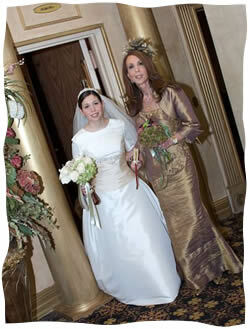 We were escorted to the special bridal room, reserved for brides who are entering the club for the first time. After I bathed, my mother, who is a seasoned member of the club, made sure I properly prepared by flossing my teeth, combing my hair very carefully, scrubbing behind my ears, and cutting my nails. She gave me helpful hints, because she knows better than I do after the hundreds of times she has done this. As soon as she was satisfied that I was ready for my "initiation," we pressed the button to call the attendant. I was all ready to jump into the warm, inviting water, but the mikvah attendant wanted to go over some final details first, like how to fully immerse, not to squeeze my eyes tight, or clench my fists, and to make sure my feet leave the bottom for a split second. Then, she took a few minutes to explain to me that my time in the water would be a particularly auspicious time for prayer, and that I should enter with the proper kavanah, concentration. She also explained some of the deeper meanings behind the journey I was about to embark on. My mother beamed proudly the entire time, so happy to be initiating her eldest into this finest, most special of clubs. The water felt magical; it took all of thirty seconds to be finished dunking, but it was the most special and intimate thirty seconds I have experienced in my entire life until now. As recommended by the mikvah attendant, I spent a few more minutes alone in the water, praying to G‑d, and feeling closer than I ever had before, and I felt like I suddenly knew so much more about life and about my Creator, than I ever could have had the chance to before. I felt like my soul had been cleansed, even more deeply than my body. She felt the pride of a mother who has done something rightAfter drying off and getting dressed, my mother met me outside to bestow the parental blessing on me, praying that I should be like our fore-mothers Sarah, Rebecca, Leah, and Rachel. She sobbed as she said it, for the moment was bitter-sweet for her. It was bitter, because in just a few short hours, she would be giving me away and sending me off to begin a new life with my husband; bitter because being a woman in her early fifties, she knew that as I begin an affiliation with this wonderful club that will, please G‑d, last many years, her own trips to the ladies club were numbered. It was sweet because she had been privileged to experience this special event with me, her only daughter, just us, no husband, and no little brothers. But most of all, it was sweet because of her past. You see, the chain of our mothers had been broken for a few generations; my mother did not even know of the existence of the ladies' club until she and my father had been married for over a year. She rekindled that lost flame, and now knows that she has also successfully transmitted it to the next generation. There is hope that the break that happened before will, with G‑d's help, never happen again. She felt the pride of a mother who has done something right, as she watches her daughter eagerly follow in her footsteps. We both felt connected to our foremothers from generations past, who guarded this club and its regulations with the most intense ferocity. I still have more ahead of me; I am sure the chupah will bring on similar emotions. But tonight, I have begun a mission and been imbued with a new sense of purpose and destiny. I will bring these with me to the wedding, and G‑d willing, into everything my husband and I will do for the rest of our lives. With new beginnings come new chances, opportunities, optimism. I pray that G‑d allows us to make the most it. But now, I must sleep; there will be lots to do tomorrow. Mazal Tov, and goodnight! Gavrialla is a senior at Stern College for Women majoring in English, and lives in Queens with her husband. Beautiful essay Your experience is one I have only had twice - on the afternoon of my Reform conversion and the morning of my Orthodox conversion. Since I was not married at the time of my Orthodox conversion and suffered a hysterectormy a few years later, I did not have the wonderful mitzvah of the "ladies' club".